Very nice scarf. The stuff is fine. Good cover for cold and outing . I recommend it for everybody. With a 100-percent Pashmina construction, this fringed scarf is luxuriously soft and durable making it perfect for cooler weather. 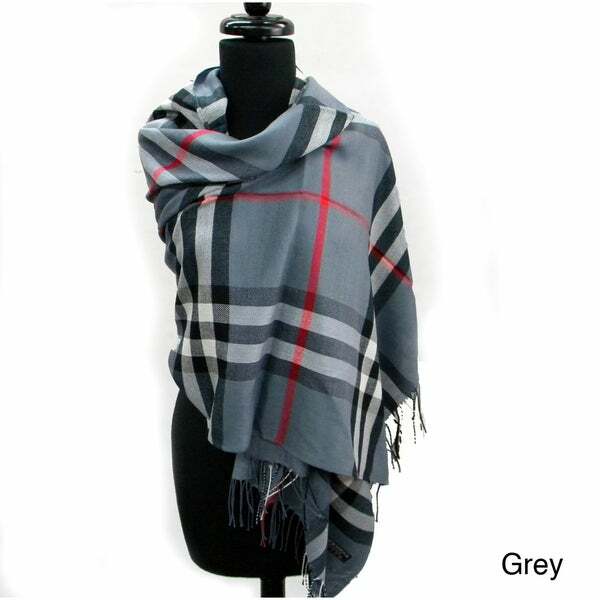 The scarf features a beautiful plaid design and stylish braided fringes. We are a small business located in New Jersey we have been inbusiness since 2009 our very creative design team is constantlycoming up with new and unique ideas on how to improve accessoriesand make them versatile for our growing client base. This was very very cheap, but people think it is very very expensive. You know the brand people will think it is. The scarf is beautiful and looks fancy! The colors of the scarf match with all outfits. I bought this well-designed, well-made large scarf to double as a fashion piece and for airline comfort during cold flights. Nice weight scarf. Looks good for the price! Not itchy like wool. I get compliments on it and people often ask if it is designer! Just be careful with zippers as not to create pulls in the fine weave. This scarf is so beautiful! It's prettier than the picture (if that is even possible). I bought it to wear on the plane because I always get a little cold in air, but don't want to lug around more to carry. It's fashionable, it's light weight but warm...a perfect find with a great price! Happy every time I wear this shawl! Beautiful, satiny finish, trademark plaid in fresh color palette--love it. This pashmina matched the purse I bought perfectly. The person who I bought these for was very impressed with it and thanked me multiple times on multiple occasions for it. The colors are just like displayed, but the scarf is a much lighter weight than expected. This was a good purchase for the price. I really liked this scarf. It looked very nice at the beginning. However, although I handwashed it and dried it flat, it started to look very "used". Just ok. Looks like famous brand from afar but not up close. Some fraying. Unfortunately the item I received looked nothing like the picture. It was too good to be true! I ordered it in the ivory color and it looked lime green. I read other reviews that said the material is very thin, but I have a real Burberry and the material is thin on that also — but it’s so not the same material. This scarf just looks cheap. It also had some runs in it like it was falling apart already. Beautiful when paired with boots and jeans. I ordered the scarf along time ago and I still have it. It’s still in great condition it’s easy to wash and it fits majority of my style. It was a great value for the price. tendencies to wrinkle a lot, obviously, so be careful to store it properly. "Is there any silk in this wrap? My mother is allergic 🙁"
I bought this as a gift for a friend and it will look great on her. Looks warm, trendy, and a good holiday gift for mom. I am looking for a scarf/shawl to wear over a dress that I am wearing to a Christmas party. This looks like it will be the perfect one! "Do you have anymore this style in sand color?" Thank you for contacting us, shan. Unfortunately, no. The Sand color is out of stock. Please let us know if you have any further questions. Hello chopichara, This scarf is beautiful! This is proudly made in the United States as part of the Main Street Revolution. The maker of this product is a small business located in New Jersey that has been in business since 2009. Their very creative design team is constantly coming up with new and unique ideas on how to improve accessories and make them versatile for our growing client base. I hope this helps. Thanks for shopping with us. The piece measures 26 inches x 70 inches long. Pashmina Shawl Scarf Wrap Border Pattern Double Layered Reversible - Beige - 28" x 70"